Real estate developers often invest in hoardings for big projects—on-site marketing signage that describes future developments. As opposed to online, radio, and print ads, hoardings are highly cost-effective marketing investments for developers, providing large-scale project awareness 24/7. 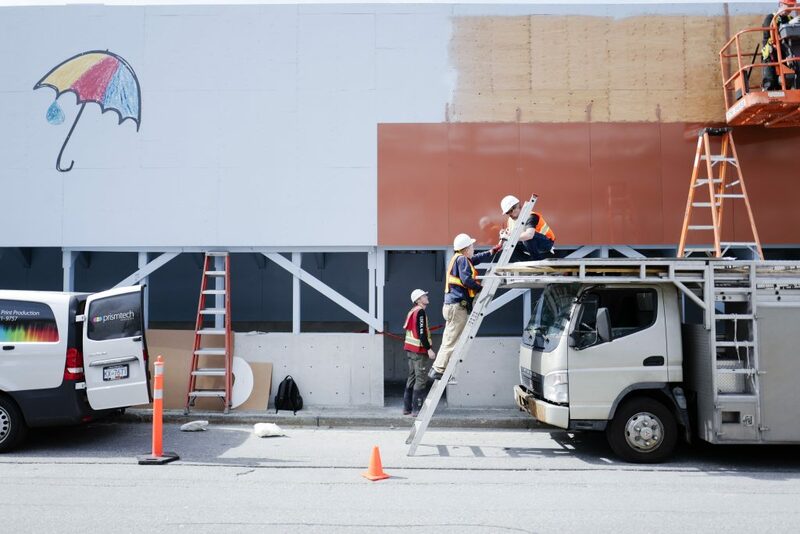 Vancouver-based developer Belford Properties took their hoarding for Sun Towers Metrotown to the next level. 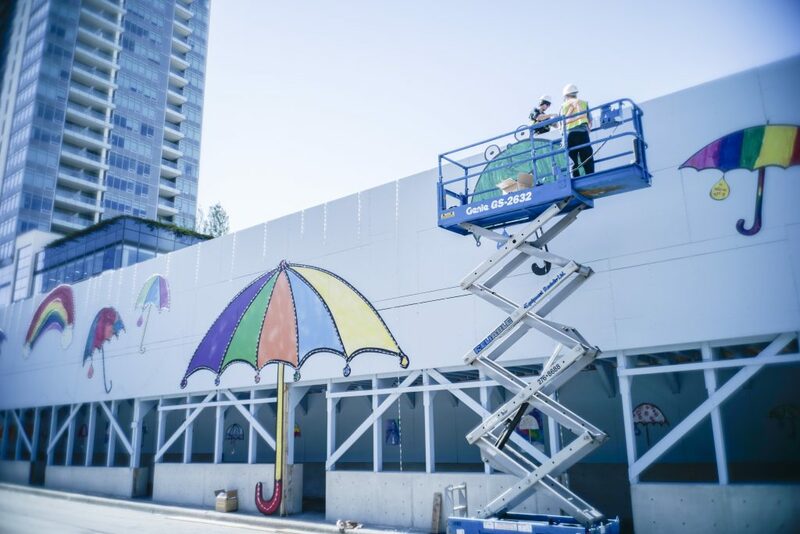 Faced with the challenge of promoting Sun Towers while building long-term community relationships throughout the development, Belford partnered with a local organization and turned the hoarding into an interactive public art display. 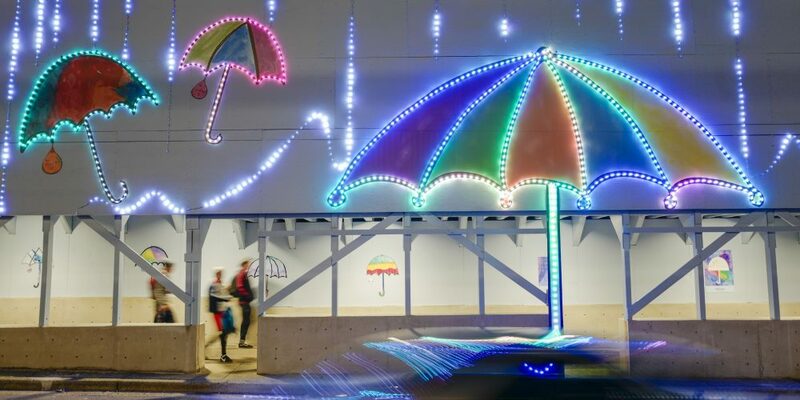 The result was a 30×170-foot billboard combining community art with interactive technology. The billboard transformed public space across from BC’s largest shopping centre, Metropolis at Metrotown, into an interactive boulevard. The Metrotown project inspired Limbic Media’s Interactive Art Wall concept, an engaging art installation with multiple applications for civic space, retail and holiday displays, and any organization looking to increase ROI through public engagement and community placemaking. This week, we are taking you through Limbic Media’s process for this project, from the initial collaboration and concept to the final installation. This is the proverb that initially inspired Belford to collaborate with Burnaby Neighbourhood House, a volunteer-driven social service agency. BNH supports programs and services that address local community needs. Understanding that youth have an enormous impact on community futures, the two organizations joined forces to support youth art education over the course of Belford’s 3-year development. 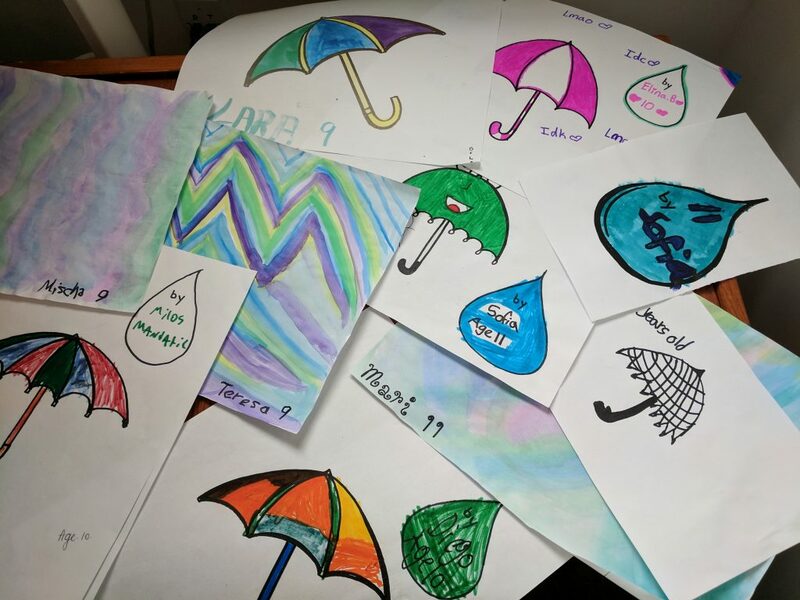 Their vision resulted in a public art concept surrounding the theme of rain + sunshine = growth to encourage yearly donations to BNH’s youth art programs. 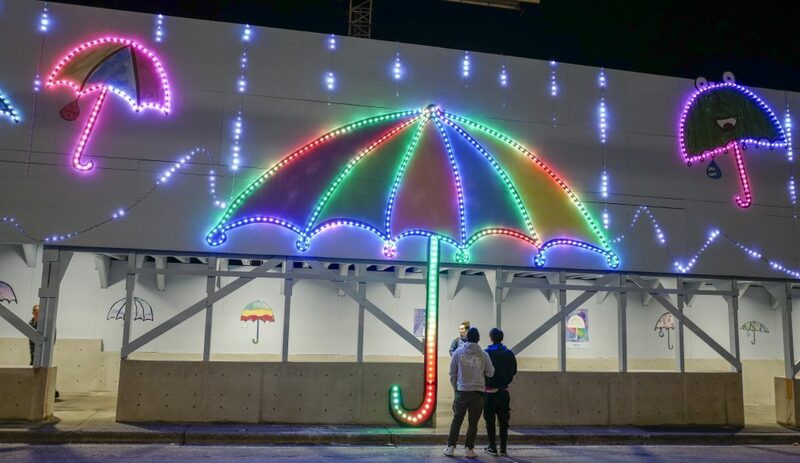 The 3-year project has three phases: the first, inspired by Greater Vancouver’s notoriously heavy rainfall, features umbrellas and rainbows. The second phase, scheduled for Spring 2019, features sunshine-themed drawings, and the third will display the fruits of that nourishment—growing flowers, bees, and nature. BNH and Belford commissioned art for the first phase to children currently in BNH arts programs. Their pieces were then scaled to fit the hoarding. Interactive public art not only fosters a sense of community and placemaking, but also increases brand awareness, foot traffic, public safety in surrounding areas, and overall ROI. Hangar 18, the project’s design and branding consultant, reached out to us to create an interactive lighting component for the billboard. 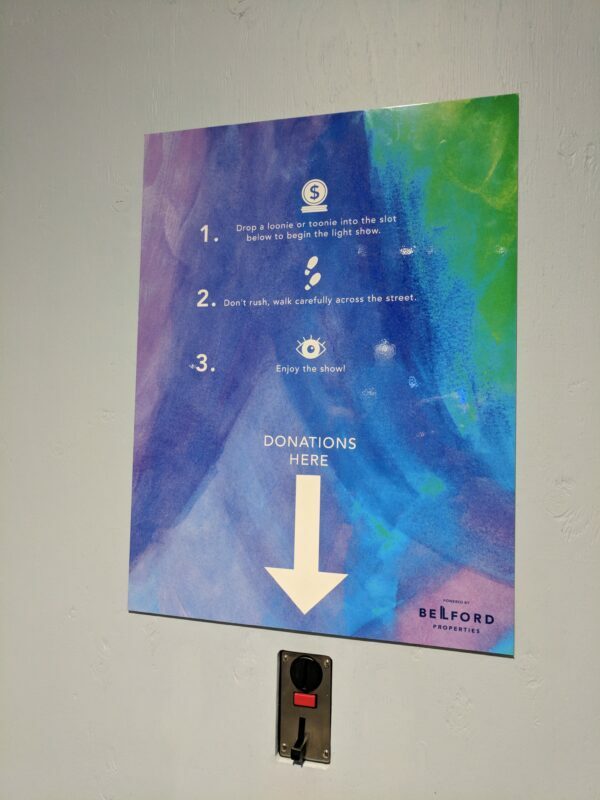 Limbic Media’s role was to design the lighting component of the installation and integrate an Aurora system with a coin box to allow for donations. The vision was to literally “make it rain” when coins are inserted, offering passers-by a lightshow in exchange for their donations. Limbic Media used Hangar 18’s concept drawing as a template for the lighting design. Our team at Limbic Media was responsible for designing the layout of Minleon Pebble Light strands over the concept art, spec out project requirements, and do custom programming to evoke rainfall and rainbow effects. The project required 61 light strands of various lengths, totaling 2,075 pebble lights. Projects of this scale require multiple Network Distribution Boxes (NDBs) along with a network switch to effectively supply power and data from Aurora across all the lights. The next step was to parse the billboard’s light strands into 9 sections; one section of light strands for each NDB. Because all the technical components would be hidden behind the billboard, the project also required leader cables of various lengths to connect the beginning of each light strand with its respective NDB. The Interactive Art Wall was Limbic Media’s first time integrating Aurora with a coin box. Our lead design engineer created a new Aurora pattern to achieve a rainfall effect for the pebble lights. The coin box was then integrated with its own microcontroller, programmed to speak to Aurora: in resting mode, Aurora tells the light strands to evoke a subtle version of the rainfall pattern. When coins are donated to the box, it triggers an algorithm that intensifies the rainfall pattern’s brightness and speed, slowly diminishing until the the more subtle resting pattern is achieved. Limbic Media’s design process was a team effort, involving sales staff, engineers, and a technical lead to spec out and price the project—all while liaising with Hangar 18 and Belford to meet the project’s vision and timeline. Once the installation was set up at Limbic Media and passed for QA, we sent the equipment with our lead design engineer to oversee and support the onsite installation process alongside Belford, and make final tweaks to the project’s custom programming. The Interactive Art Wall was a huge success as an alternative to the average hoarding. Unlike a regular marketing billboard, the display’s interactivity increased a community-building ROI in addition to potential monetary gains. Lighting and interactivity leveraged Belford’s marketing for the Sun Towers development by encouraging public participation in the display and also increased awareness of BNH and their impact on community initiatives. By providing an opportunity for hashtags and social media engagement, the interactive display created an additional marketing tool for both Belford and BNH. The interactive hoarding captured Belford’s vision as a developer that is mindful of its surrounding community and involved in its long-term, people-based goals. Providing a reward for donations to the initiative in the form of a light show also piqued public interest from passers-by in a way that stand-alone donations boxes can’t. The hoarding brightened the thoroughfare at Beresford Street, potentially increasing return foot traffic to the area. Overall, interactivity at the Metrotown installation played a crucial role in placemaking and fostering community development out of what would otherwise remain a typical urban development on an ordinary roadway. If you find yourself near Metrotown Station over the next few years, check out the installation, make a donation, and be sure to share your interaction on social media with #celebratebby. The Interactive Art Wall concept has potential across multiple applications. Light fixture styles and custom patterns can be adapted for unique themes and mounted against a variety of backdrops and settings. If you are interested in combining interactivity with a similar concept or initiative, contact us today to brainstorm ideas. Photos by Mandy Jin at WeTopia.